A simple multi close to the pretty, rural church of St Erney. This is a small, pretty rural church which was onece the "Mother church" for Landrake. 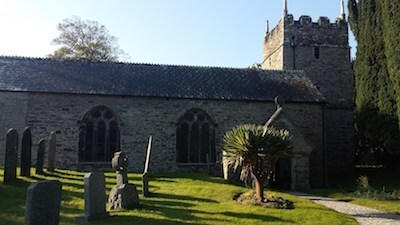 It is usually locked because of its isolated location - the churchyard contains a number of unusual fine specimen trees. The Church is first recorded in 1269 and the building is mainly of the 14th and 15th centuries but the enclosure which surrounds the church suggests an early Christian site which could be from Celtic times. It may have been a chapel connected with the priory at St German's since it is possible to ford the river at low tide at Markwell. The tower and nave are late 13th century and the chancel probably mid 15th century. There was a substantial restoration in 1872 which included re-roofing and rebuilding the north and south porches. The window to the west of the tower is probably 19th century set in the opening of a formerly larger window with a rough segmental head and inposts remaining. There is an embattled parapet with later granite obelisk pinnacles. There are 3 bells of which the treble bears an invocation to the Virgin in Old English letters. The second is dated 1671, the tenor is plain. The font is probably 13th century but could be made from something older. There is an oil painting of the Blake coat of arms dated 1770 in a lozenge indicating a female member of the family. In the tower is a hatchment with The Lord's Prayer and Creed obtained in 1718 at a cost of £2 10 0 and an extra 1/6 for "bringing it in ". The pews are 19th century. There is an 18th century sanctuary chair in the chancel There are monuments to the Blake, Geake, Steed and Rawe families and a alter piece in memory of Rev Frederick John Behenna vicar 1893 to 1927. The headline coordinates take to the porch entrance of the church. To your left, as you face the porch, is a gravestone to John Dyer. The cache is a camo'd plastic tube 10 cms long by 3 cms diameter. It is a short walk away and the hint should make it a straightforward find. Please re-hide carefully and you may need tweezers to extract the log. BYOP. !! Please do not attempt this cache at night time!! Onfr bs n Ebq Fgrjneg Fbat haqre n fgbar.